Jim Sanders at Hidden Genealogy Nuggets website and blog has created the Genealogy by the States blogging prompt, suggesting each week we blog about an ancestor or one of our families that have a connection to that state. This week's state is Pennsylvania. My connection to Pennsylvania comes from my mother's Mast ancestry. Immigrant Jacob Mast is the earliest Pennsylvania settler in my ancestry, coming to the United States when many Germans were immigrating to Pennsylvania, the 1700's. 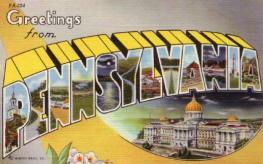 Other Pennsylvania surnames include: Berkey, Forney, Hershberger, Livengood, Schrock, and Seese. A book written by Eli Mast titled Mast: 1737 Immigrant Jacob Mast, that I found at Allen County Public Library in Fort Wayne, Indiana, details Jacob's life. I have used this book to find clues for further research. It details Jacob's immigration to Pennsylvania. The book states that Jacob Mast immigrated in 1737 aboard the ship, Charming Nancy. He is listed aboard the Charming Nancy which arrived in the United States in November of 1738. Jacob Mast lived most of his life in Berks County, Pennsylvania. He died in March 1772 leaving a family that has expanded and flourished throughout the United States. Here are a few of the many internet sources I have used to research my Pennsylvania ancestry. Click on each on to be taken to that website. I love the old maps at the link you provided above. I do, too. Thanks for your Genealogy by the States ideas.